Cancer is so limited.... It cannot cripple life, it cannot shatter hope, it cannot corrode faith, it cannot ... Filled with stories of courage for anyone dealing with cancer, this book combines uplifting Scriptures from the NIV, inspirational quotes, and encouraging stories from both male and female cancer survivors. 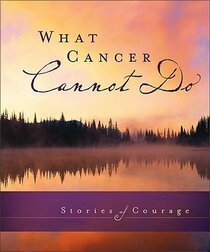 About "What Cancer Cannot Do: Stories of Courage"